The game is actually now getting pushed back to July, but the game is going to just be much better for it. It's just development time. What a shame, I know many of our readers were looking forward to this later in the month. Now more to the point, why doesn’t anyone cool ask us out for lunch? Hey, if they're making it even better it will be worth it. why don't you guys get asked out to lunch? XGen, Noo, are you reading this? buy these men a sandwich! not to say it isn't good or anything, it just doesn't appeal to me. i wish they delayed it 2 more months, and fixed online. if Brawl's online was half as good as Mario Kart's, it wouldn't be collecting dust right now. mario kart's online is amazing. anyway, what do you do on this game? how do you play? I think it's better if games are delayed to be better. Of course, Brawl was delayed so much I wasn't very hyped for it, but whatever. Delayed until July?! DAMN!! But it does give me time to catch up and get Toki Tori and LostWinds...in addition to VC. But, dang, I wish it came out earlier, I want to download the game and just say that I have a Strong Bad Video game. Well, If the game will be BETTER for it, Then I'm cool with that. 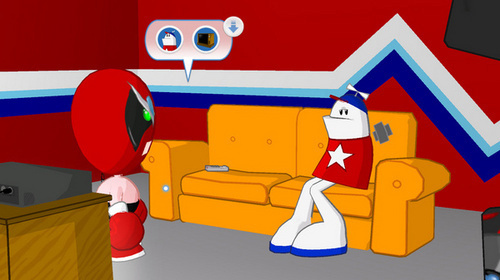 I've been waiting 3 years for a Homestar Runner Video game, I can wait 'til July. Besides, that means more Brawl time for us Europeans! They need the time to make the game work, that's more than fine with me. Maybe they're just doing it so that someone can email Strong Bad and ask him why the game's being delayed...oh well I'm willing to wait if it's for the better.